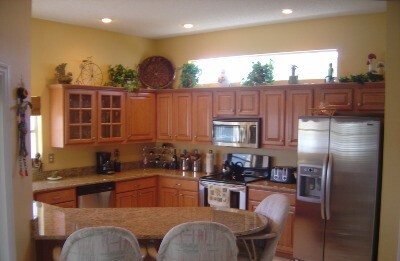 Pricing for cabinet refacing varies from each kitchen depending on the product selected and size of the kitchen or bath. Removing existing doors and drawers. Preparing existing cabinet frames and boxes for new wood veneer or laminate. Wood kitchens - 1/4" veneered prefinished plywood on exterior of cabinet with real wood veneer on cabinet face. High quality custom built and finished solid wood doors and drawer fronts in a number of species to choose from or can create your own. Hinges replaced with concealed self closing hinges or soft close hinges. Drawer boxes replaced using veneered plywood or solid maple drawers with conventional dovetails including new drawer slides or soft close drawer slides. Includes trim moldings needed to give a complete and finished look. To get a more accurate price for remodeling your kitchen or bath, contact us to send us the linear footage of your base and wall cabinets and the style door that is desired and we will send you a free estimate. Or we would be happy to measure your kitchen or bath and bring you some samples at a time convenient for you. Roll out drawers in base cabinets which allows you to slide out the contents of the cabinet. Why tear out all of your cabinets and buy new again when you already own the foundation to a new kitchen. Most likely, your existing cabinet frames are better built than most new cabinets today.